Hue enjoys afternoon tea, one of her favourite pastimes. She has become famous for her amazing tattoo work. People visit her from all over Scotland for body art. She is proud of her Vietnamese roots. There’s little in comparison between Việt Nam and Dundee, the fourth largest city in Scotland. You won’t find a Vietnamese restaurant there and if you were to ask for a cup of coffee made from egg whites in a greasy spoon cafe, chances are you’ll get a stare like you were from another planet. But flying the flag for a country some 10,000 kilometres away from the east coast of Scotland is Huệ Nguyễn. This young artist is building a reputation as one of the best tattooists around. 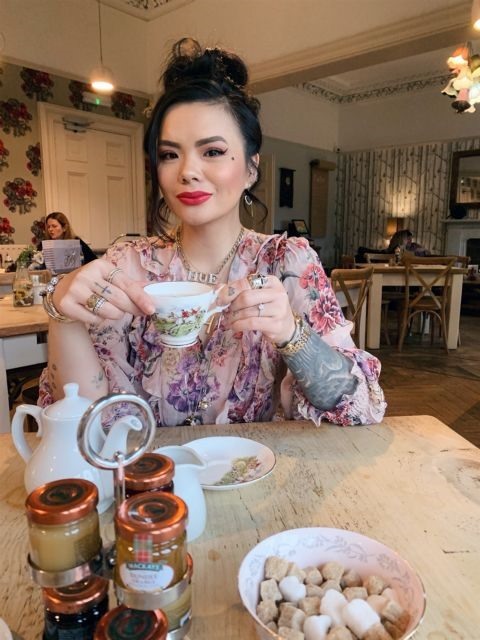 A regular face on MTV UK’s reality TV show, Just Tattoo of Us, Hue may not have the Vietnamese accent, but her roots are firmly grounded in Southeast Asia. “I was born and raised in London,” said Hue, whose parents are from the Xuân Hòa Commune in the Phú Yên Province. And Dundee is now home. “Where my family is from compared to Dundee is so opposite to each other,” she said. “My parents’ home is still a very simple way of life fishing and farming and trading with the neighbours. Dundee is an up and coming city and now home to a V&A Museum. A fear of flying until recently prevented Hue from visiting the country, but once she overcame her anxieties she was here in a flash. “Sadly I have only been once,” admitted Hue. “I used to be scared of flying so I didn’t go anywhere. But eventually I went and met my family and had the best time. So I will be back. My mum visits a lot. “My parents were refugees and ended up in the UK during the Việt Nam War. My dad was a fisherman and took the risk to bring his family to safety on his boat. After completing her degree, Hue combined her education in business with her natural artistic talents. “I have always loved tattooing but it is a taboo in my culture and my family. But after getting a degree in business studies my dad felt I had a secure backing to go for my dream. So I finally started my portfolio and got an apprenticeship. “I started out as a realism artist, as most artists choose just one style. That didn’t last as I love all art and felt I didn’t have to corner myself to one style. Appearing on national television has not done Hue any harm when it comes to attracting new business, but what keeps clients coming back is her natural talent. Renowned music PR manager Murray Chalmers is one such regular. “When I first decided to have a tattoo I heard about this fabulous person called Hue. I couldn’t believe she lived here in Dundee,” said Chalmers, who manages PR for some of the biggest names in pop music. “Coming back to live here after being in London for many years, I was struck how you had to search for glamour amongst the grit, just like in punk times when I grew up here. Hue is glamour AND grit. She’s the real deal. “Our first tattoo was the David Bowie Aladdin Sane flash. Since then we’ve explored the history of art on my body - Schiele, Klimt, Warhol, Keith Haring - and also icons like Siouxsie Sioux and Grace Jones. “Hue gets it. In a world of conformity and blandness she stands out as a beacon of creativity and joy. As Việt Nam as a country grows, tattoos are no longer seen as taboo, as was often the case in the past. Last year hundreds of tattoo artists from around the world descended on Hà Nội for a massive convention. Hue’s advice to young tattoo artists is simple. “You need to believe and never give up,” she said. “I know that sounds a bit clichéd but it’s true. I think today we forget to dream and follow our hearts. “I still believe in the magic of the mountain god and water dragon - the legends that made Việt Nam what it is today. Anything is possible, just don’t hold back. “Get inspired from everything around you and put in the hard work. So believe, dream, wish, stay positive and put in the hard work. As a city, Dundee was cruelly denied the opportunity to compete for the title of European Capital of Culture after Britain voted to leave Europe. “in comparison” means looking at how one thing is similar or different to another thing. To stare means to look at something with concentration or interest. A planet is a body like the earth that floats in space. To build a reputation is to become known for your quality of work. Regular means something that happens often, or is seen many times. To have an accent means to speak a language with a hint of your original country or area of birth. To be up and coming means an area is gaining more attention and opportunities are growing. Anxieties means the feeling of fear and panic that happens when you are stressed. Refugees are people who have fled from their birth country because of war and other circumstances. A portfolio is a collection of your work. An apprenticeship is a training programme. Abstract art is art that shows something that is not real, like a landscape or a bowl of fruit, but is rather made up of shapes and colours and, or, patterns. I’m influenced by everyday life, buildings, weather, people and fashion. To be influenced means to be forced, or persuaded, to think in a certain way or to do certain things. Icons are people who are heroes in certain areas. “In a world of conformity and blandness she stands out as a beacon of creativity and joy. Conformity means acting in a way that society wants you act. Blandness means being without colour, creativity and imagination. If something is an inspiration, it makes you want to go out and do something positive in the world. A taboo is something that is unacceptable. When people descend on a place, they arrive there in great numbers. A convention is a big meeting. Huệ Nguyễn loves to fly on aeroplanes.